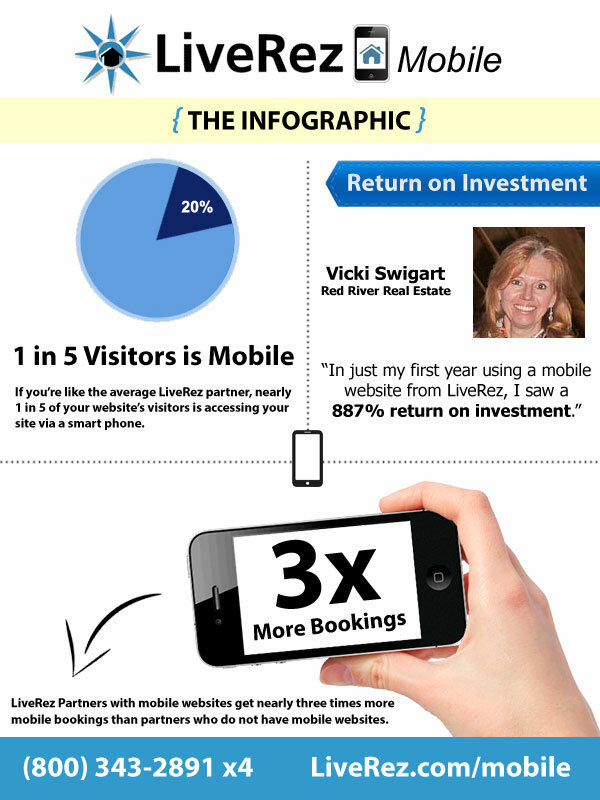 Click on the image above to learn how our mobile websites have helped our vacation rental manager partners. They’re calling it the mobile apocalypse. In February, Google, the world’s top search engine and No. 1 trafficked site, announced a ground-breaking update to their search algorithm that will go into effect April 21, 2015. And, if you don’t have a mobile friendly website, you need to pay attention. Google’s goal is to provide the best experience to its users. When people do a search for something on their mobile phone, they don’t just need the best results, but the best results displayed and accessible in the most convenient way. And, if you’ve ever tried to access a website that isn’t mobile friendly on your smart phone, you know how frustrating it can be. So, while the first part of Google’s algorithm uses a variety of signals to reward relevant, quality content, the second part of the algorithm is about the presentation of this content. So, if you have great content but people are having a hard time viewing it and interacting with it, you are underserving the user. And if the goal of Google’s algorithm is to connect people to websites offering the best user experience, it makes sense for them to send people to websites that satisfy both of these goals. This being said, on April 21 Google will start labeling websites as mobile friendly or mobile unfriendly and using this rating as signal for ranking these websites in mobile search results. The Jist: If you don’t have a mobile friendly website, don’t expect Google to send many mobile searchers to it. Check out this short video from LiveRez VP of Sales and Marketing Tyler Hurst to learn more. Right now you might be asking what the fuss is all about. It’s just mobile traffic. Well, in the last few years mobile traffic has absolutely exploded, and the experts don’t expect it to slow down any time soon. At LiveRez, over the past few years we’ve seen our property manager partners’ mobile traffic increase from as little as 5% to as high as 35 or 40%, and it goes up every year. We’ve also found that partners that have a mobile website are more than 270% more likely to get a booking when someone accesses their site on a mobile device than if they didn't have a mobile website. Mobile websites are no long just something nice to have, they’re now expected by your guests. And, as you can tell by its most recent update, Google now expects it too. Well, the first thing you need to do is determine whether or not your website is mobile-friendly in Google’s eyes. And with their mobile friendly testing tool, Google's made it extremely simple. All you need to do is enter in your URL and hit analyze. Google will let you know within seconds if your website is mobile friendly or not. The next step would be to implement a mobile website, if you haven’t already. LiveRez partners will have it easier than other managers. While many of our partners have already adopted mobile websites, we can help those that haven’t very quickly. Just give our professional services team a call at (800) 343-2891 Option 4. If you’re not using LiveRez, your software or website provider might have a solution. Surprisingly, though, we’ve found that many don’t have a solution in place for their users. In that case, give us a call at (800) 343-2891 Option 1 and we’d be happy to talk with you about the benefits of our all-in-one solution. Our implementation team is the fastest and most thorough in the industry, and we can get you up and running in no time at all.